There is a huge variety of lighters available on the market, something to satisfy all possible tastes. From elegant luxury items or casual models for every day, to colourful and extravagant, even flashy. But design isn't everything, for many people their main concern is the functionality of the lighter and the type of flame it produces. Type of flame: It's helpful to know whether the lighter will be used for cigars or cigarillos, and it's also important to know if it will be used mainly outdoors or inside. 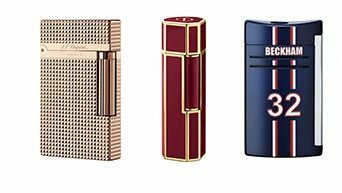 Appearance: Aside from the main task of lighting cigars or cigarillos, a lighter is also an accessory reflecting the style of its user, it can enchant with its appearance, with the shine or opacity of the finish, whether metallic in golden or silver tones, or in an endless variety of colours to suit any taste. The ergonomics of the design, its shape, texture and weight, and the ease of use, all add to the pleasure and comfort of using one lighter over another. Free shipping from $129. For order value under $129 additional shipping costs apply. Strikeout prices are suggested retail prices.